You have one? 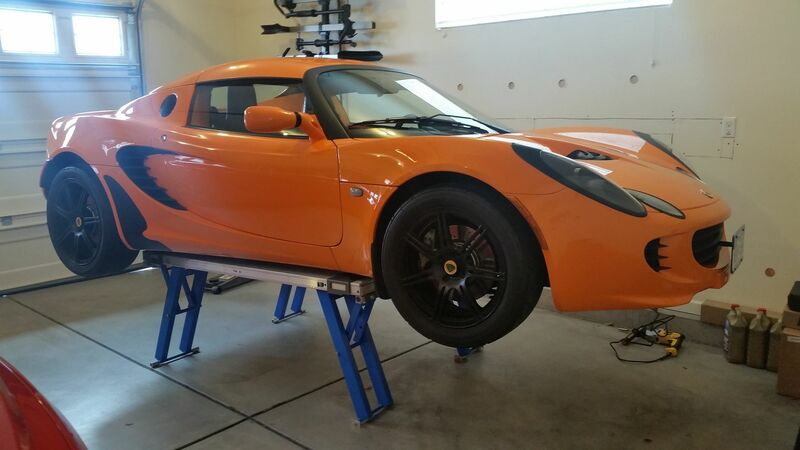 If you are shopping EZCarLift is way better. I have looked at both and seen both in person. I would not feel safe doing anything with a Quickjack other than swapping tires. The car is not very stable on it. exlondoner and nintense like this. Nick, that looks good. I've been toying with the idea of picking up a 4-post but it takes up a lot of room. Please provide more details. I've been on the fence for a while now between the Quick Jack, EZCarLift, and a mid-rise scissor lift. Last edited by Turbopun; 05-30-2016 at 08:24 AM. Curious if you considered the 3500 model at all? Sumbata is that the Midrise? I have the garage ready with various outlets, but my guess is that a 15-30a would easily suffice. Check out the website they have lots of videos. Made in USA. Car is extremely sturdy on it. I have used it to lift my Lotus, Corvair Spyder, and Volvo S60. Very well made hence the higher price. Simple operation, goes up and down to any position using an electric drill. I too was looking at a 2 post or 4 post but found the EZcarlift which I have been extremely happy with. Nick, can you post a pic of where the front posts ends up when lifting? I'll check if I have one tomorrow. It hits under the door aft of the normal jacking point. Boytcho Manev the maker of the lift talked with Lotus and was told it was acceptable to lift here. Give him a call he's a very nice guy and has done a lot of research on lift points on various cars. I am starting this thread as i have not seen any other lotus guys using Quickjack. I've used mine several times, and find it to be reasonably secure. I won't work under the car without additional jack stand support, but don't bother with jack stands for work that doesn't require crawling under. For example, I changed out dampers recently. I needed a 1/2" breaker bar to crack loose those big fasteners and had no worries about the car rocking. It was plenty solid enough. I noticed that even though the two lifting frames have only one prop rod each, they could have two (one on each side), as both sides of the lifting frames have the bracket that catches the lower end of the prop rod. I plan to try to buy a couple of prop rods as replacement parts, or if unable, to make them myself. Then would only need two longer bolts to mount them. after lifting the car me and my friend rocked the hell out of the car and it was as solid as you want your car to be. I even tried lifting it from the front. I guess it really depends which points are being used. With the QuickJack there are you using the MWR kit in the back?